I had heard the buzz about La Sagesse Nature Centre on La Sagesse Beach for some time, and naturally wanted to see for myself what the deal was. So on one of my island tour I decided to stop in at take a look. Am glad I did. La Sagesse Nature Centre not the place for every visitor. And Jerry Rappaport who run operations at La Sagesse Nature Centre will gladly let you know that. If you need more than your companion, great food, and the beach to be turned on, then your best bet is to remain in the more populus Grand Anse area at oneof the other hotels. La Sagese Natuere Centere on La Sagesse beach is for those of us that just want to getaway. Those of us who don’t need any external trappings to have a good time. Those of us who just want to reconnect with that special someone, or take a relationship to the next level. I can tell you from what I experience at La Sagesse Nature Centre you will get all those things. When I arrived I stepped onto the beach to take some photos, and got the distinct feeling that I was intruding. And you know what? Am sure I was. 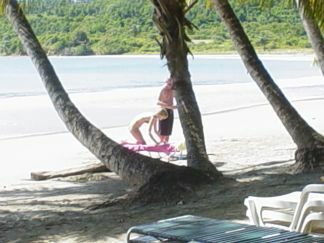 There were about 6 individuals on beach chairs in the shade of the coconut trees that line La Sagesse beach. Some were sunbathing, some were reading, and the others just absorbing the place. La Sagesse Beach was named One of the 10 best beaches in the Caribbean” by Travel & Leisure in 2002. 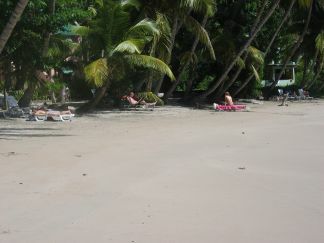 Now you would think that a top 10 caribbean beach like La Sagesse beach will be crowded, right? Well you will be wrong. 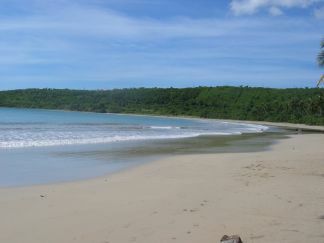 La Sagesse beach is not a very popular beach among Grenadians. It’s out of their way. And just too boring for most locals.Grand Anse and Bathway are always their favorite choices. It’s ironic that the very thing that makes La Saggesse beach popular for us (the seclusion) … makes it unpopular with most locals. On weekends you will see a few locals from nearby villages. On weekdays you will hardly ever see locals on that beach … I saw none while I was there. The few times that you do run into a local couple on La Sagesse beach you can be certan that their motive for being there is the same as yours … they do not want to be seen nor disturbed. 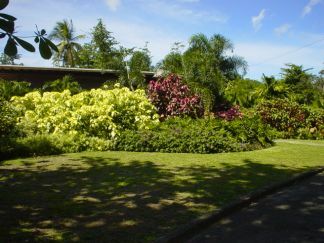 What else will youl find at La Sagesse Nature Centre and La Sagesse Beach? The gournds are well kept and lovely. As we drove down the narrow bumpy road to get there, it was plain to see why it was called La Sagesse Nature Centre. Sounds of birds, beautiful flowers and plants abound everywhere. I heard there are hiking trails, but we did not get a chance to explore them. 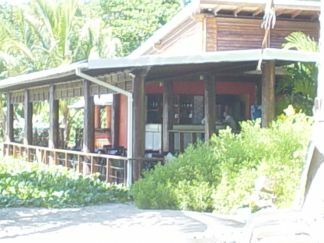 La Sagesse Nature Centre has one of the best seafood restaurants in Grenada according to the Boston Globe. Jerry suggests you call ahead of time so the chef knows exactly what to prepare and for how many. I visited grenada for the frist time in 2009 I’ve been back four more times after and hoping to visit at lease three times for each year my husban is from Grenada.The best experience of my life ,I wish I could stay forever the beaches are beautiful and I’m a beach baby how would I get locate la sagesse beach?